One of my favorite childhood stories was “The Little Red Hen”. If you are unfamiliar with the fable or forgot how it goes, the Little Red Hen finds a grain of wheat and asks for help from the barnyard animals to plant it, but they all refuse. As the story proceeds through watering, harvesting, threshing, and making bread, the hen repeatedly asks, “Who will help me?” But with each request, the response of the barnyard animals is the same. “Not I.” Finally the hen has completed her project and asks who will help her eat the fresh baked bread. Now all of the previous non-participants eagerly volunteer to consume the product. However, she refuses to share with them because none of them helped her with the work and she proceeds to eat the bread with her chicks. As a child, I never questioned the ending of this story. It made perfect sense to me—if you don’t want to help with the work, you don’t get to enjoy the outcome or have any say in it. It is true that God calls us to be generous and gracious to those in need, but we also need to pitch in when there’s work to be done. Maybe you are critical of the Little Red Hen for not being more hospitable to her barnyard friends, but it seems to me that maybe they needed to learn a lesson. In my opinion, the Little Red Hen had a servant heart. She didn’t complain about the work that needed to be done, or shame the animals that didn’t want to help, or avoid the work altogether like her barnyard companions. She simply asked others to join her in the work. For the past several months, I’ve been involved in the process of recruiting volunteers. I have searched for greeters, care shepherds, contact people for serve groups, praise team members, people to run video, operate the projection system, design worship slides, work in the nursery, serve coffee on Sunday mornings, serve meals, and more. My requests have found many servant hearts and many Not I’s. Sometimes I am guilty of being like the Little Red Hen and trying to do all the work myself, but I can’t. Nobody can. We need each other. We all are the body of Christ and each one of you is a part of it. You can read more about that in 1 Corinthians 12:12-17. Would you consider playing your part in 2019? I know many Little Red Hens that would be grateful. Daysi and I love road trips! This is one of the things we have in common. 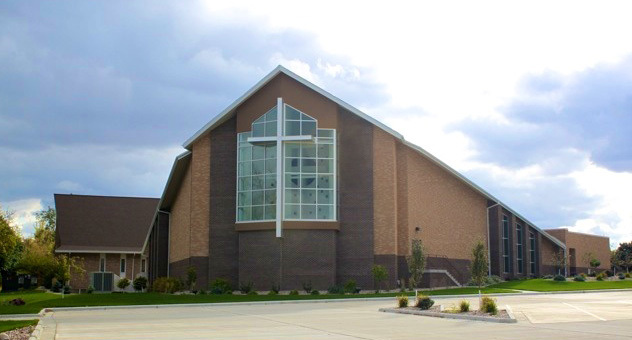 In the summer of 2003, after my second year of seminary was done, we drove from Holland, Michigan, to Tulare, California, to serve as a pastoral intern at Tulare Community Church. While we very much enjoyed our time on the road, our children had a very hard time understanding why we needed to be on the road for more than one day. They didn’t care about the journey; they wanted to get to the destination as soon as possible! Waiting, for them, was nonsense. Being in a car for a long period of time was for them the most boring thing on earth. On the way we stopped in different beautiful places like Grand Canyon National Park and Yosemite National Park to give them some kind of joy for the journey, but the “are we there yet?” had no ending. When we finally made it to Tulare, we were happier than them! Just like a long road trip, Advent is a journey toward a destination. It’s the season of hopeful expectation. It’s a time of waiting. But what is it that we are waiting for during this season? The obvious answer is Christmas! But Advent is more than just waiting for a holiday, and it’s even more than just waiting for the celebration of the birth of Jesus. Advent is the season that teaches us that we are in journey to a destination, and that we must enjoy the journey as much as we enjoy the destination. When the set time had fully come. What we do during the journey itself is just as important as the destination. How will you spend your time waiting? How are you going to spend your time during the journey? 1. What are the places in my life where I am waiting for God to do something? 2. How can I focus on the journey of Advent more than the destination? 3. What can I do to prepare the way for the Lord in my life, my home, my church, and my community? We must do a better job in enjoying the journey while we wait for God’s appointed time. Our culture has taught us to live in the here and now, and thus we have lost the value of waiting. What does it mean to wait in hope? Waiting in hope means holding on tight, hoping with expectation and trust, knowing that our Lord is not just making us wait to see how much we can take. Waiting in hope means complete dependence on God, knowing that he will intervene in our affairs and will answer our prayers. Waiting in hope means that we are to be near him at all times, knowing that the only way to enjoy the journey is allowing his presence to guide us. My prayer for each one of you during this season of Advent is that you will enjoy the journey as you await for the final destination. I’ve been thinking a lot about gifts lately. Probably because it’s less than 3 weeks until Christmas and there are only 2 presents beneath my tree. Why do I always procrastinate? It’s not that I don’t enjoy giving gifts to the special people in my life, I just don’t particularly enjoy shopping for those gifts. Thankfully, gifts aren’t really that big of deal in our family, although our children might disagree. As my husband would say, “It’s Christmas all year long at our house.” We both grew up in homes where pennies were pinched and non-essentials were rarely purchased. But as time has passed and we’ve been able to loosen our financial belt a little and no longer cross our fingers until the paycheck is deposited, we tend to buy things when we “need” them and not wait for a holiday to roll around. That being said, I still can’t convince myself that there doesn’t need to be at least a few festively wrapped packages under the tree on Christmas Eve. Maybe my struggle with gift-giving is less about my dislike of crowds and shopping malls and more about the challenge of trying to find the perfect gift. You know, the one that causes their eyes to twinkle and a smile to erupt and makes them squeal with delight! That’s the reaction I enjoy, but I’m also a practical gift giver. Without exception, each year packages under our tree contain socks, underwear, hygiene products, clothes, food, and other necessities. These are good gifts, just not ones that create excitement. So what makes a gift good? Are good gifts only those that we ask for or the thing that we desire the most? I’m not convinced. Some of the best gifts I ever received are ones I didn’t even know I wanted. In some instances, they seemed to be the exact opposite of my request. Maybe some of you have been presenting your wish list to the Father hoping that he will come through. Maybe you’ve been praying for a Christmas miracle, but you feel like all you are getting is socks and underwear. Your requests are good, but don’t miss out on the love of the Giver because the gift isn’t what you expected or asked for. Regardless of what lies beneath your Christmas tree when December 25 rolls around, there’s one gift that’s guaranteed to be perfect. Paul tells about this gift in Romans 6:23. “The wages of sin is death, but the free GIFT of God is eternal life in Christ Jesus our Lord.” This gift has been given to all people, but just like the other presents under your tree, it must be received. Nobody leaves a present under the Christmas tree because they didn’t feel like opening it or because they thought it could wait until next year. Yet many have set aside the most amazing gift of love ever given. God loves you so much that he gave his one and only Son so that if you believe in him you will not perish but have everlasting life. Open up your heart this year and receive Jesus. Best. Gift. Ever. Have you been watching any Hallmark Christmas movies this season? I do not spend a lot of time watching television or movies, but I’d likely be a little embarrassed to admit how many of these flicks I’ve watched over the last couple years. My husband thinks the shows are ridiculous, my brother claims they are way too predictable, and my kids say the movies always end with a beautiful snowfall and a couple falling in love. Honestly, I don’t really care if they are predictable, they are good clean entertainment and simple to follow. Life isn’t always as predictable as these ninety minute Christmas stories. When I was a teenager, I decided I would go to college to be an architect, settle in a big city, help people build their dream homes and eventually start my family. It was a picture perfect vision of what my future would look like and yet through a series of events, my life turned out very differently than I had planned. I actually found myself engaged before I even started college. Never in a million years did I anticipate marrying a guy who loved to farm or living in rural Rock County. Fast-forward twenty five years and there is not one part of God’s plan for my life I would trade for my own ideas. God has had a plan to redeem His people from the very beginning of time and we read about that plan throughout the pages of scripture. Several hundred years before Jesus was born, the prophet Isaiah shared a prophecy – or a prediction – to the people of Israel. It was a powerful message of both judgement and hope. Isaiah warned the people to repent of their ways because the Prince of Peace was coming and He would sit on David’s throne and over his kingdom. (Isaiah 9:6-7) It took Isaiah’s words about 400 years to happen, but when they did, the people missed it. While they had cried out for a Messiah, the events that took place when Jesus was born were so far from what the people thought would happen many refused to believe He was indeed the Messiah. As Jesus grew and began His ministry the people knew He was special, but many remained puzzled if He really was the Messiah. We read in the book of Matthew Jesus asking the disciples “Who do people say the Son of Man is?” (16:13) They reply with a variety of answers, and then Jesus focuses in on Peter and asks, “What about you? Who do you say I am?” (vs.15) Peter knew exactly who Jesus was because as he had been intimately following his Teacher. God revealed Jesus’ true identity to Peter and his answer was, “You are the Messiah, the Son of the living God.” (vs.16) Peter knew his life had forever been changed and his days of tangled fishing nets were but a distant memory. While I would never compare a silly Hallmark Christmas movie to God’s great love story in the Bible, we too know how His story of redemption ends. One day Jesus will come to this sin-filled world again and rescue His people from darkness. His entrance to this world will look different than the first time and, once again, the arrival time is only known by the Father. While on earth, Jesus instructed us to “keep watch, because you do not know on what day your Lord will come.” (Matt. 24:42). Advent is a time we not only look back at His birth, but forward to His second coming with great anticipation. It is also a season to ask ourselves if we are keeping watch. Are we spending time in the scriptures and with our Father to know our Savior like Peter did? No matter how troubled our situation or how evil the world becomes, we must continue to be God’s faithful people who hope for His return and not complacently wait for the ending to take place or we will miss it just like many of the people did all those years ago. This past weekend, the Jacobsma clan gathered together at Grand Prairie Events for an auction of my late father-in-law’s treasures. Bernie was an avid collector of toys—tractors, implements, trucks, horse drawn carriages and more. The 2-day event was fun; fun to be together, fun to assist the auctioneers, fun to see familiar faces, and fun to imagine how much Dad would have enjoyed being there. Some family members are also involved in collecting toys and know a good deal when they see one, but that is not the case for me. I am in the same category as my sister in law who said, “I clearly know nothing about toy auctions. Things that I thought would go cheap brought a higher dollar and things that I thought would do well, sold low.” We just couldn’t make sense of it. As I reflected on the weekend, VALUE seemed to be the theme that kept coming up for bid in my mind. Ultimately the value of each item was determined by the highest bidder. Some bidders saw the possibility of an item increasing in value or maybe re-selling it for a profit. Some saw the value in buying a gift for a loved one at a discounted price. Other bidders determined value based on sentimental reasons. Such was the case for my daughter. She loves horses and loves Grandpa and she was not going to stop bidding until the set of Appaloosa horses and wagon was hers. Regardless of the reason, in the end, each toy sold for an amount that someone was willing to pay. There’s a story in the Bible about an auction. It’s found in the book of Hosea. Hosea was a prophet to the people of Israel, warning them of the calamity that was going to come if they continued to be unfaithful to their covenant with God. In an unusual “object lesson”, God commands Hosea to take a prostitute as his wife. Hosea obeys the Lord and marries Gomer. The local people must have thought he was crazy. Hosea and Gomer have 3 children together before old habits resurfaced. She walks away from Hosea and returns to her former ways of prostitution. But God isn’t finished with this lesson. He tells Hosea to go after his wife even though she is unfaithful, and to love her as the Lord loves the Israelites even though they also have been unfaithful and worship other gods. So Hosea goes to the local auction and purchases Gomer for 15 shekels of silver and some barley. Now, I can’t tell you the value of a shekel, and I’m not sure that it’s important, but we do know from Exodus 21:32 that the going rate for a slave was 30 shekels. This gives us a pretty good idea of what the other bidders thought Gomer was worth. I have to wonder if there were even others that were interested, or if Hosea offered the only bid.